The Package starts with a guided tour of the Greater Accra Region, the capital of Ghana. The tour starts with a drive to the national museum, and to the Kwame Nkrumah Mausoleum (the final resting place of the 1st president of Ghana). After lunch we continue to the centre for National Culture for shopping and also witness beautiful art collections and Artifacts and then to the W.E.D. Dubois Center for Pan African Culture. After breakfast, the trip continues to Boabeng Fiema Monkey Sanctuary. 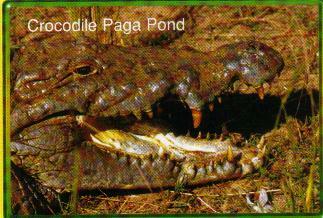 Ghanas most famous example of traditional African conservation. 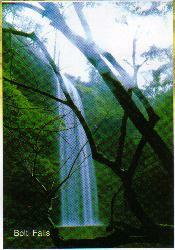 Continue to the Kintampo water falls to experience nature and its beauty. Lunch is arranged. 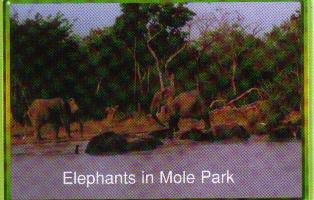 We then continue to the Mole National park Via Larabanga. The night is spent at the Mole Motel. The day starts with an early morning guided hiking through the Mole National Park. The Park has about 93 species of animals, including herds of elephants, lions, bucks and many more in an area of 4840sq km savannah land. There are trained Tour Guides with Riffles to take you round the park. After breakfast, we move from the National Park to Larabanga for a visit to the Larabanga Mosque (A 13th century Mosque believed to be one of the holiest sites in the country). We proceed to Tamale (Northern Regional Capital) for lunch. After lunch, the trip continues to Navrongo. The night is spent at Navrongo. After breakfast the trip takes us to Paga where every Pond in the town has crocodiles living in them hence considered as a sacred sanctuary for crocodiles. The crocodiles are enticed from the Pond by the custodians with fowls. These crocodiles are harmless hence the possibility of holding a life crocodile for a life time. We continue to a slave market where you will be entertained to music with different drum rhythms from the rocks around Return to Tamale for an overnight stay. Depart Accra at 0700 Hrs through the Hohoe district to the Wli a small farming village in the Hohoe District where the highest waterfalls (THE WLI WATER FALLS) in the country can be located. The Water Falls can be seen after a 45 Min. Walk, through cocoa farms and crossing of streams (the deepest to the knee level). Tourist can swim in the pond formed by the water Falls. Lunch is served at the pool side in the calm atmosphere and the splashing of water from the falls. We proceed to the highest mountain in Ghana. The trail to the mountaintop is very interesting. There is much joy and self-accomplishment after one has conquered to the top of the mountain. The day ends with a dinner and the night spent at Hohoe. Early morning drive after breakfast to Akosombo to board the Dodi Princess for a cruise on the Volta Lake with life band music on board to the Dodi Island. The band entertains you to good African music, lunch is served on board the Dodi Princess. The whole day is spent on board the Dodi Princess with a little time spent on the Island. The nights is spent at Akosombo where dinner is arranged. The last day starts with a guided tour of the Akosombo Hydro Electric Plant and the Dam (the largest man made lake in the world). The Akosombo Hydro Electric Dam supplies electricity to all parts of the country and to neighbouring Benin and Togo and sometimes to Cote Divorie. A stop is made on our return journey to Accra at the Shai Hills Game Reserves which is part of Ghanas commitment to the presentation of its natural heritage and wildlife. A game viewing drive is arranged to enjoy the beauty of wildlife in their natural habitat. On a good day a lot of the animals will be seen. Return to Accra arriving at about 18:00hrs.